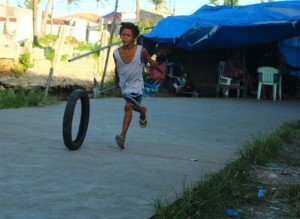 In the weeks after Super Typhoon Haiyan devastated the central Philippines last Nov. 8, Martin Nañawa, a communications staff member in our Philippines office, reported on the children, youth and adults struggling in its aftermath. Six months after the storm, he reports on their recovery. Here is his first dispatch. Tacloban looked really shiny from my airplane window. It was the glint of freshly installed corrugated metal sheet roofing — many homes and businesses whose walls still stood had recently repaired their roofs. When ChildFund’s emergency response team first landed in Tacloban, the city was the dire place the world was hearing about in the news. After what I had seen then, progress – any kind of visible progress – was welcome news. I’d see more signs of it as I made my way through town. Utilities have been restored throughout the city. I’ve heard there are occasional power outages, but supply is largely stable. This is a far cry from the city that was swallowed in darkness each night. Water supply and mobile phone coverage have also been restored. In Tacloban, children are playing again, even though signs of the typhoon’s destruction remain. The public transportation grid is working again. Passenger jeepneys (local, privately owned minibuses) and commuter tricycles are plying the road once more. Some are even back to reckless driving, which is another indicator of normalcy, for better or worse. Public transportation also indicates fuel supply has also been restored. I spotted many gas stations newly repaired or nearly so. Right after Haiyan, gas stations lay partially or completely in ruins and were subsequently ransacked for their fuel supply. Tacloban’s streets have been cleared of rubble and rubbish. In the first days after the super typhoon, cars were strewn about the roads like some toddler’s toys. Now, nearly all the wrecked vehicles are gone from the streets, and the remaining automobile husks are parked neatly in front of their owners’ lots. Commerce in Tacloban is also struggling to recover. Many businesses have repaired and reopened. Markets, restaurants, boutiques, electronics and assorted services often sport large painted canvass streamers announcing their reopenings — no need to live off packed rations or relief goods anymore. I walked into a little corner fast-food eatery for lunch and enjoyed a good, cheap meal while watching a noontime vaudeville on TV, seated next to a few school-aged girls giggling over Facebook on their phones and tablets. It felt like Haiyan had never happened there. The volume of lechon (roast pig) stalls open throughout the city also surprised me. Lechon isn’t cheap, and it’s usually served only at fiestas or large banquets. School is out for the Philippines’ summer break, from late March to the first week of June. Teachers say ChildFund’s Child-Centred Space training was critical in the months of January to March, when school had to resume but children were not physically and emotionally prepared. These same teachers feel more confident that they’re in better shape to start school in June. Still, in contrast to local businesses, school buildings have largely not been repaired, and teachers expect to run up to three shifts of students using each surviving classroom. Quonset hut-like structures built by responding agencies will help ease congestion in classrooms. Though signs of progress and recovery were apparent everywhere, so are Haiyan’s horrible scars. Though large structures-turned-evacuation centres, like the astrodome by the bay, were now empty or under repair, numerous tent cities can still be found in the city. Homes and businesses that suffered greater damage remain neglected. Many residents or shop owners just aren’t prepared to rebuild, or they’ve abandoned Tacloban for Cebu, Manila or elsewhere. Children play around a large ship carried and deposited on dry land by Haiyan’s storm surge. 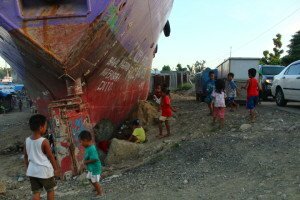 The large ships that Haiyan’s storm surge carried and deposited on dry land, right on top of a seaside community, remain in place – solemn steel monoliths to remind the city of Haiyan’s toll. The ships’ hulls are now covered in graffiti – some are messages of encouragement, but there are many expressions of grief and rage. 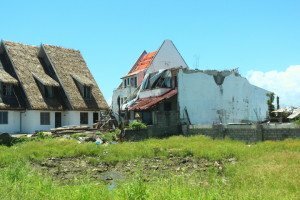 Tacloban is rebuilding, but it’s rebuilding over not only terrible physical and emotional scars but also pre-existing conditions. Businesses may be restarting, but lower-income households, whose earnings derive from agriculture such as copra production, have it harder. The threat of malnutrition, already observed in Leyte before Haiyan, has only further been compounded by the scarcity endured until only recently. 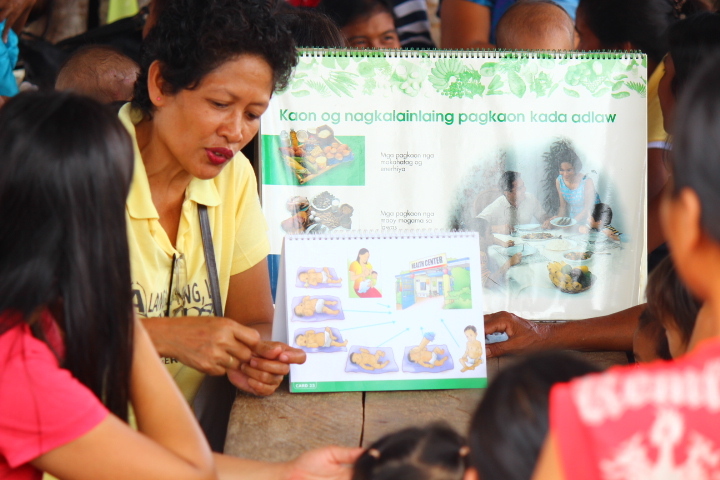 ChildFund is working with communities to combat malnutrition in super typhoon Haiyan’s wake. In this community, we have vegetable gardens and training activities for pregnant women, and new mothers. Having personally seen Tacloban on its knees, I’m thankful to see it struggle to its feet now. I’m thankful to be a part of this effort. I’m thankful to colleagues at ChildFund who’ve laboured, wept and struggled alongside Taclobanons for six months now. Of course, I’m also thankful to donors who’ve helped us do what we do. ChildFund will continue to play a significant role in Tacloban’s recovery. ChildFund is invested in an early recovery strategy that tackles livelihood restoration, nutrition and child protection challenges faced by post-Haiyan Tacloban and other affected areas in the central Philippines. Funding for ChildFund’s nutrition and child protection projects was made possible through grants from UNICEF. You can help by sponsoring a child in the Philippines or donating to our emergency fund. Six months after the super typhoon, Tacloban City shows signs of recovery. Still, clear and often pained signs of the catastrophic destruction Tacloban endured, and its human cost, remains visible.